These screen shots are not in order of time. – So, for now, I've put a commentary around each screen shot, as a little help for everyone on how to read these screen shots. (More screen shots from earlier in the evening, showing the steady "good showing" of the Condit vote count, will be up on this page soon). 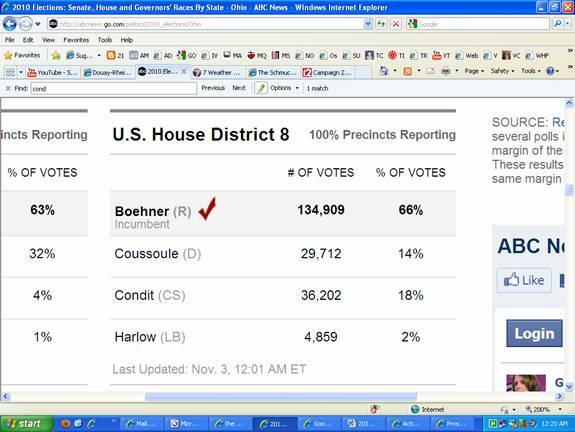 This first screen shot is from Cincinnati Channel 12 TV (a local CBS affiliate) news website, at 11:06 PM EST on November 2, 2010. 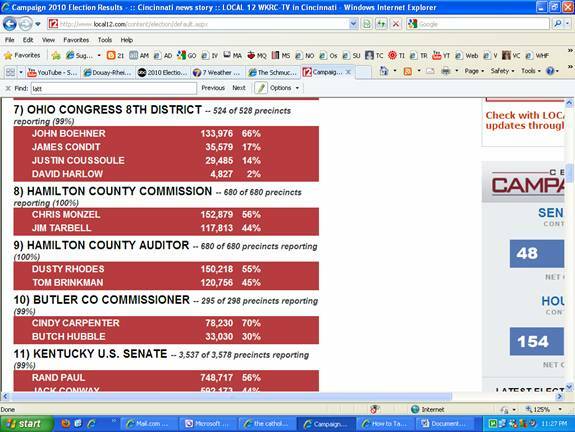 Notice that the Condit vote count is at 2% of the vote, with 79% of the precincts reporting. This followed the time period from roughly 9 PM to 11 PM where local 12 news showed 55% of the precincts reporting, and Condit with 15,000+ votes, representing roughly 18% of the vote. Now – 21 minutes later (see bottom left corner of screen shot) the same local TV 12 website shows 99% of the precincts reporting, and the Condit vote at 35, 579, representing 17% of the vote. 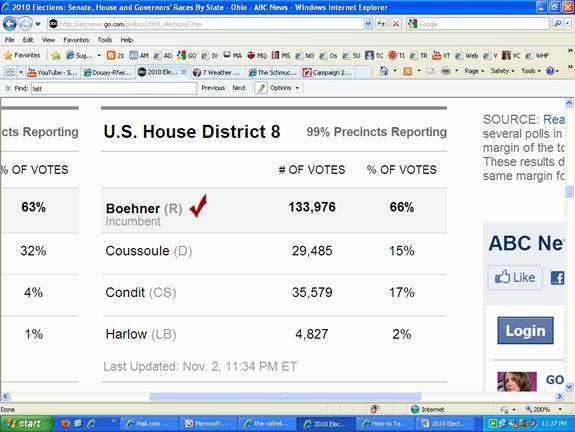 Note that the Democrat, Mr. Justin Coussoule is in 3rd place with 7,000 less votes than Condit. This is in sync with what was shown all night, from roughly 9 PM to roughly 11 PM on all media sources that reported on the vote totals of all four candidates in the John Boehner race, -- both on air on TV -- and their websites. Here is the NATIONAL ABC News website (see words in top blue line on top of website). ABCnews.go.com is also visible in the address bar if you have enough magnification. This screen shot is from 11:37 PM EST – and shows 99% of the precincts reporting – please note that the Condit vote is at 35,579, representing 17% of the vote, while Democrat Coussoule is in 3rd place with 29,485 votes, representing 15% of the vote. Please note that the national ABC website screen shot on this page – matches exactly with the local Channel 12 news (a CBS affiliate) screen shot on page 2. The screen shots on page 4 are BOTH from ABC News national website. One is at 12:20 AM EST – showing the Condit vote total at 36,202 votes, representing 18% of the vote. 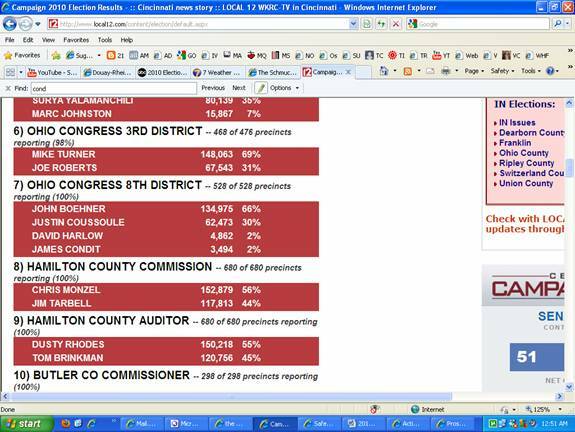 Notice that the top screen shot on page four – shows 100% of the precincts reporting, so this is a FINAL count. But 46 minutes later, the same ABC News national website has a NEW “final count”, showing the Condit vote at 3,494 votes, or 2% of the vote, or last place. The difference between my first "final count" and my second "final count" on ABC News national website is 32,708 votes, i.e., 32,708 votes were subtracted from my vote total in the first "final count." 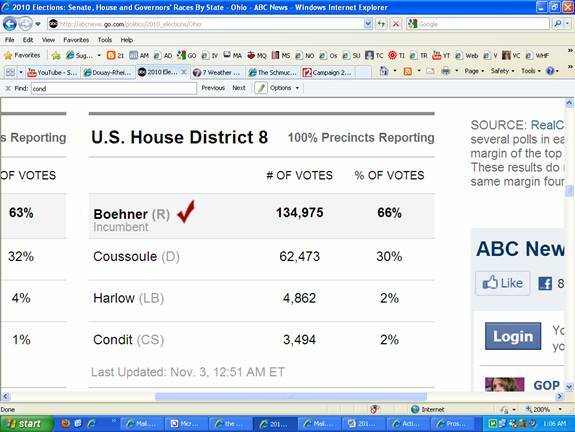 Note that the Democratic candidate, Mr. Coussoule, now has 66,473 votes, or 30% of the vote count. Math will show that ABC added 32,708 votes to the Democrat's total in the second "final count" -- plus 53 votes. In other words, the exact total that was subtracted from the Condit vote count in the second "final count" -- was ADDED to the Democrat's vote count -- PLUS -- ABC added an additional 53 votes to the Democrat's (Mr. Coussoule) vote total in the second "final vote." Leaving aside motives, this is what happened. It is shown in the HBO documentary, Hacking Democracy, starring computer votefraud investigator Bev Harris – that this type of last minute falsification can be done by the "computerized votefraud syndicate" – as easily as you and I highlight and then fix a typo or a misspelled word in one of our word documents. 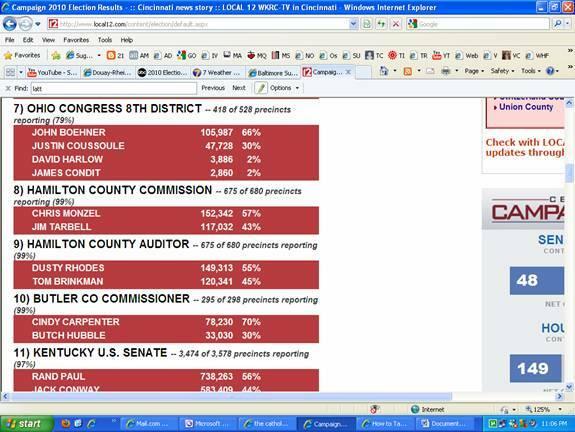 Please note that on page 5 we have also the exact two “final results” on the local Channel 12 WKRC TV website. (Remember, Channel 12 in Cincinnati, Ohio is a CBS affiliate – so obviously CBS news national and ABC News national are getting their results from the exact same source). Please note that the local TV 12 screen shots are 23 minutes apart. MORE COMMENTARY BELOW SCREEN SHOTS ON THIS PAGE. What is this talk of a "consortium" of the Big TV Networks? Since the 1960s there has been such a consortium of the Big TV Networks, which manifested in the company Voter News Service (VNS), which changed its name to National Election Pool (NEP). 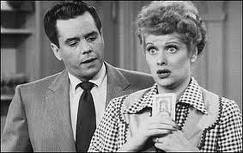 The original company in the 1960s was owned by ABC, CBS, NBC, and Associated Press (AP) wire. CNN joined in the 1980s, and FOX joined circa 1996. The 5 Big TV networks and AP wire service cooperate hand in glove with Diebold, Hart, Sequoia, and Election Systems and Software (ES & S) -- the big four computerized vote-counting companies that count 96% of the vote in the USA on election night. Furthermore, the Big Media, along with these four, sinister mega-companies, -- cooperate with the national leadership of the Republican and Democratic parties to pull off this theft of the USA via computerized votescam. The sin of the local county Boards of Election is that they have allowed themselves to be persuaded by the RNC and the DNC to STEP ASIDE -- and hand over the processing of the ballots to the four big computer vote-processing companies. In other words, over the last 22 years, and even earlier (back to 1973), the Republican National Committee (RNC) and the Democratic National Committee (DNC) have cajoled, threatened, bribed or incentivized the LOCAL Democratic and Republican Party leadership in each county to delegate the "counting" of the local ballots in each county to either Diebold, Hart, Sequoia, or Election Systems and Software (ES & S). So in about 99% of our 3141 counties in the USA, these sinister companies "count" the vote in secret, on secret computer programs. And the police power in each town and county are used to make sure that no candidate, no reporter, and no citizen can have access to the ballots on election day. So no one can double-check or challenge the "results" released by Diebold et al -- and the big media reports these "results" as if they were verified and sent down from heaven. IN OTHER WORDS, you and I, as voters, provide window dressing for the gigantic scam now passing for American "elections." Therefore, the major MEDIA, neck deep in the treason, will never report on what is going on, with the exceptions of a few minor reports here and there, which are probably initiated by an honest person in the news team. These minor reports, many of which are on YouTube – are treated as unimportant “novelty” stories by the big media. The drug rehab problems of Paris Hilton and Lindsay Lohan are given much more time on the major media. Such gossipy reports are meant to distract the American people from the takeover of the country and the world that is being accomplished by this computerized votescam.